Just a little post on a new product launch by Sleek MakeUP that i spied whilst i was in Superdrug today. For a limited time only, you are able to get your mitts on Sleek MakeUP's Blush By 3 trio blush palettes that are available in 5 different shades. Blush By 3 is available in 5 shades: Pumpkin, Flame, Lace, Pink Sprint and Brown Sugar all suited to every skin tone. 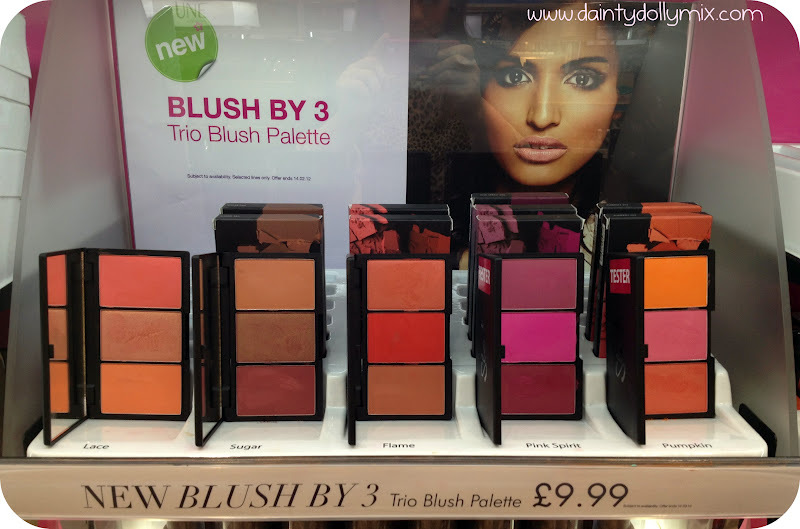 4 out of the 5 blush palettes contain a shimmer blush whilst Pink Sprint is made up of 3 matte shades. Lace looks the most popular currently as it was the only one out of stock in my local Superdrug which i was a little gutted about as that is probably the one out of all of them that i would have picked up myself. I do believe that each blush in the palette is the same size as a individual Sleek MakeUP Blush that retail for £4.29 each so this saves you some money and comes in a handy little palette, similar to Sleek MakeUPs usual packaging and has a mirror in the compact. You can pick yours up now from select Superdrug stores nationwide until the 11th April 2012 or while stocks last. N.B: Photos sneakily taken in Superdrug by myself! I quite like the look of Sugar and Lace I think. Do you know if any of the colours are the same shades that are in the individual blushes? Oooh Lace looks really pretty! Wow they are a really good idea! I want flame/lace. ohh I prefer pink spirit and pumpkin, they're gorgeous! These look amazing, I want! omg hellooooo sugar and flame!!! love the palettes! do you know where to get those here in LA? Lovely!!! Wish I could get my hands on some!! These look amazing! Great to take different blushes with you On the go! Saw these today, can't take my eyes off Pumpkin!! Flame is also gorgeous, going to have to pick one of these up, great value! I'm drooling... These blushes look great. I have my eye on Lace! wow! I wish we had those here! I almost bought lace the other day, wish I had now as it's probs out of stock! I have just discovered your blog and am now following. I've got sugar - love it so much. If you are light-handed, they are gorgeous layered over each other. Mehndi is a very integral part of Indian culture. People of Bangladesh and Pakistan also apply Simple mehndi design for left hand on their hands and feet for special occasions. In weddings, it is a mandatory ritual for both Hindus and Muslims. Apart from its traditional forms, a lot of new styles have evolved in the recent times. These designs definitely add a dash of culture and ethnicity to traditional celebrations. Read on for more on different kinds of mehndi designs.